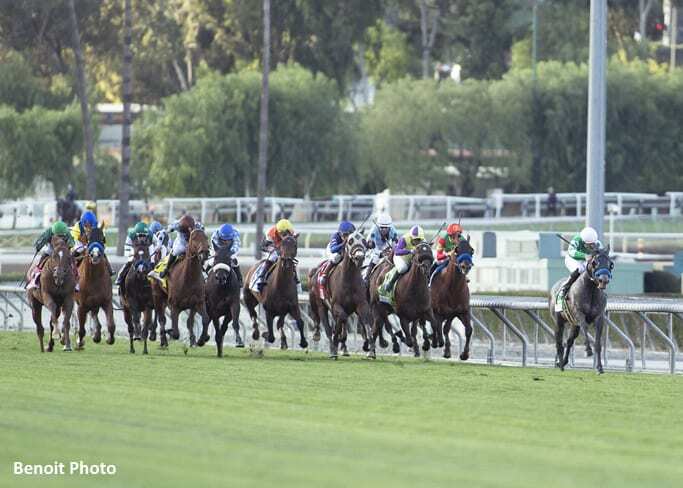 The luck of the Irish carried the day in Saturday's Grade II, $200,000 San Marcos Stakes at Santa Anita, as Irish-bred Platinum Warrior carried his Irish-born jockey Shane Foley to a 16-1 upset win. Trained by John Sadler, the 4-year-old grey colt by Galileo got a mile and one quarter over a “good” turn in 2:02.37. Breaking mid-pack in a wide open field of 13 older horses, Platinum Warrior was a handful in the run under the wire the first time and pulled Foley into a dogfight for the lead with Argentine-bred Roman Rosso up the backstretch and into the far turn. Racing in the two-path while turning for home, Platinum Warrior opened up what appeared to be a four length advantage approaching the sixteenth pole and managed to hold off late surges from both Epical and Beach View for the win while providing Foley with his first-ever win at Santa Anita. Based in Ireland, Foley had been Platinum Warrior's regular jockey prior to his U.S. debut at Arlington Park in Chicago four starts back on Aug. 11. A close fifth, beaten 2 ½ lengths with Foley up in the Grade II San Gabriel Stakes here on Jan. 5, Platinum Warrior paid $34.40, $13.80 and $8.40. Owned by Yuesheng Zhang, Platinum Warrior, a Group III winner in Ireland on May 27, is now 12-3-1-0 overall and with the winner's share of $120,000, he has earnings of $208,290. “Since we have been training we were always looking at the longer races, we were kind of waiting,” Callaghan said. “The preps are always a little shorter, so we thought he ran well last time. He got beat by two lengths, kind of got stuck on the inside so the mile and a quarter, we were really looking forward to that today. In a huge effort under Tyler Baze, the Jim Cassidy-trained Epical, who lunged at the break while getting away a step slow, outgamed Beach View for the place. Off at 7-2, Epical paid $5.80 and $4.20. Beach View, trained by Leonard Powell and ridden by Rafael Bejarano, was off at 7-1 and paid $5.40 to show while finishing 1 ¼ lengths in front of Ya Gotta Wanna. In what appeared to be the best betting race on an 11-race card, 3-1 favorite Chicago Style checked in fifth with Drayden Van Dyke. Fractions on the race were 23.37, 48.22, 1:13.24 and 1:37.67. This entry was posted in NL List, Racing and tagged galileo, john sadler, platinum warrior, san marcos, San Marcos Stakes, santa anita, santa anita park, shane foley by Paulick Report Staff. Bookmark the permalink.